above: an elegant choice of Digitalis, possibly D.trojana or D. ferrungea. 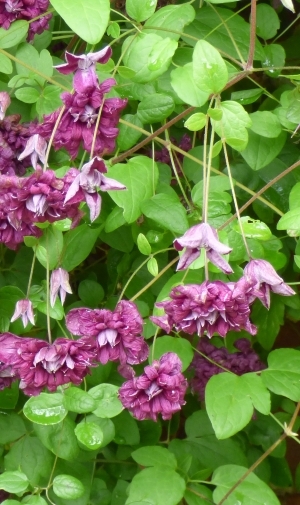 above: this double clematis graced many gardens I visited this Summer. After the previous day's one-two punch of Sissinghurst and Great Dixter, Day 3 of my Summer tour of British and Dutch gardens, with Bay Area gardeners Jeannine Zenti, Mike Collins and Frank Eddy, included the award winning garden of Pashley Manor , a Tudor/Georgian manor house in Ticehurst. As with Borde Hill , I did not expect to find much that would translate well in San Francisco gardens, but I kept an open eye and found some elements to appreciate, and unlike Borde Hill, I learned an interesting feature about the garden, before leaving it behind. The Grade I timber framed house, built in the 1500's and extended in the 1700's, is currently owned by the Sellick family and closed to the public. However, there is a lovely attached cafe and wisteria-clad terrace at the end of a tour, past the pool garden, a Victorian greenhouse, and the kitchen garden. above: sometimes it's the utilitarian that grabs my eye; three simple yet stylish gates act as garden sculpture. I decided to forgo the rose garden (of course!) and wandered around the set of large forested ponds. Story has it that the original home, from the 1300's, sat on a moated island, and that the ill-fated Anne Boleyn visited from her home at nearby Hever Castle. As I walked the forest path, simple garden gates framed the occasional cut-outs to the pasture beyond. The effect of geometric silhouettes within windows of light, in the midst of rolling trees, reminded me of the eye-catchers used in landscape gardening: something obviously man-made to remind you that you are a guest on someone's property. above: if anyone knows the identity of this lovely tree, please tell me. I love its unusual coppery olive color and fine texture. Again, we stopped to speak with the gardeners, including one who had just left corporate life a few months ago, and that's how we found out what makes this garden special, especially later in the Summer. It is the annual replanting of tulips, this year numbering 30,000. What does that have to do with later season displays? Well, besides the big draw of the annual Tulip Festival in the Spring, the removal of those very same tulips delays the planting of the borders. The delayed planting of the beds extends the life of the borders and the overall season of the garden. Plants that had already passed in other places were just hitting their stride, and new ones were being dropped in bare spots the day of our visit. 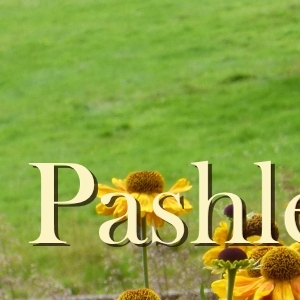 In a country where visiting gardens is a national sport, Pashley Manor has found a way to diversify its revenue streams by having a Spirng event, an extended season of interest, and loads of sculpture (available for purchase) peppering the grounds. I would encourage two of those methods.